There are some really powerful characters in the book, even though quite a few of them end up dead when the book is finished. I clearly have feelings for each of them, whether good or bad. Shanna and Aaron are of course the protagonists of the book. Then there is Ensel Rhe, a warrior and mercenary who has a lot of history which is not explored in the book. He is extremely powerful, resourceful and talented, and cannot be taken lightly. Erlek Abn Nee is the person who creates all the problems in the book in his quest to harness the elemental magic which the Elementalists had access to. He is ruthless and someone who I found to be disgustful. I am sure this is exactly the reaction the author was hoping for. The wizards, Elsanar and Ansanom are part of the larger conflict between the Druids and the Elementalists. And finally, there is Serena, who has a small, but really important role to play in helping Aaron in put an end to the conflict. The characters are all terrifically developed, and are still fresh in my mind, days after I finished reading this book. The history of the world in which the story is based revolves around to classes of people, the Druids and the Elementalists. Both of these, can wield elemental magic, but the Druids are more powerful, and do not depend on any external objects for their magic. The Elementalists are a faction who broke away from the Druids, and who were opposed to the restrictions they placed on using elemental magic. This war is still raging, and the Druids are bent on eradicating all Elementalists and their descendants from the face of the earth. This is the conflict in which both Aaron and Shanna find themselves embroiled. The story moves along two completely separate paths which only meet at the end. 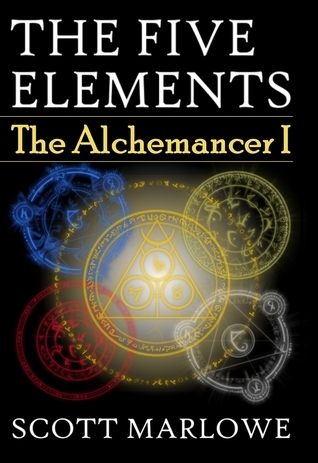 In one, Shanna and Erlek Abn Nee are on a quest to retrieve the four elements created by the Elementalists, which will allow them to access the elemental magic which the Elementalists and Druids had on hand. The ruthlessness of Erlek and the change in Shanna’s attitude during the quest is something that kept me turning the pages with urgency to find out what would happen next, and what they would have to face in order to get to the next element. Also, it clearly brought out the greed for power which comes from having such a huge source within grasping distance. The growth of Shanna’s character as she realizes her destiny and what exactly she has access to was mesmerizing. But, it was kind of disheartening to see the change in Shanna from the carefree girl to someone drunk on power. On the other hand, Aaron is on the run along with Ensel Rhe as he is pursued by dwarfs and hell hounds who want to kill him. He remains just out of reach and seems to reach safety at last. This is where he meets Serena, another wizard’s apprentice. I was surprised to see a new and very important character being introduced this late in the book. But, considering this is a series, it seems to be fine. I do think that Serena will play a really important role going forward in the series. There is of course an inevitable showdown between the Druids and the Elementalists in the end. This was actually difficult to read because Aaron is forced to make a decision which goes against everything he holds dear. The strength of his character clearly shone through in the end. He had an amazingly tough decision to make, and he ends up doing the right thing even though it is extremely painful for him. I wonder what I would have done if I were in his place. Would I have chosen the easy way out and decide to procrastinate the inevitable, if I were in his place? I really don’t know. I loved the story and it was the perfect combination of elemental magic and adventure. But, the ending of the book is just a bit too perfect for me. It seems as if the author has made this book into a series as an after-thought, after this book was already released. The story ends at a place where we can’t see any villain in sight, and the protagonists are now as happy as you can expect them to be. The central conflict of the book also seems to have been resolved. I have no clue what the author will be writing about in the remaining books in the series. There are no plots or story lines which are left unexplored to really keep me interested. This is something that really puts me off. I don’t really have anything to look forward to now. Will I read the next book in the series? I think so, but just to see what the author has come up with to extend the story. Unless he can pull the proverbial rabbit out of the hat, I may be done. This entry was posted in Book Reviews, Fantasy and tagged Aaron, Alchemancer, Druid, Elementalist, Five Elements, Scott Marlowe, Shanna. Bookmark the permalink. Great review, Ritesh! I absolutely loved this book – it caught me off gaurd! I agree there isn’t much to make a sequel from, althought anything is possible. What might be really great is a prequel. Oh wow! I did not think of that, but a prequel would be really great! Set all those years ago .. The elemental attack scene was one I went back to many times. It took a lot of tweaking to portray it just right. As for the characters, I’ve gotten consistently similar feedback so it’s nice to know I did something right. 🙂 It’s a little known fact that initially Shanna had been relegated to a supporting role. The attention was all going to be on Aaron who embodied both sides of the story. But then I had a revelation and Shanna suddenly took on the role you read about. In hindsight, it fit so much better. Last, I should say that we haven’t seen the last of the elementalists’ influence. They had enough time to conceive of more than just the Five Elements. To your point of this novel not having set things up for the next one… you’re right. I should have done a better job leaving some hooks behind. I’m going to write up a post to discuss this in a bit more detail, so I’ll just leave it at that for now. Yes, now that you say it, I can see the series coming along quite well. The focus of this book was so much on Shanna and the conflict between the Druids and the Elementalists, that thinking beyond that is a little difficult unless pointed out. While reading the book, I somehow got the feeling that Shanna was the last descendant of the Elementalists. Think I may have misread that? No, that’s exactly right, which is why I said in my comment the elementalists’ “influence” and not the elementalists themselves. The druid/elementalist conflict is more or less done. In the next book, you’ll start to see the elementalists’ technology side more so than their magical one. Again, I probably should have made this overarching storyline more clear in this book, but I think in the next one you’ll look back and see where I’m going. The next book is titled “The Nullification Engine”, by the way. Thanks so much Scott, this does make me think of all the possibilities!